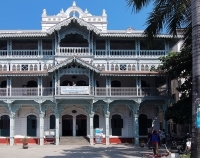 An architectural symbol of the mixed bag of cultures evident in Zanzibar's history, the elaborate Old Dispensary was so named because it long housed a dispensary on the ground floor, with a pharmacy and resident doctor. An affluent Ismaili Indian merchant, Tharia Topan, who financed the building project, laid the first brick 1887 and the building was completed in 1894. One of the most decorative buildings of the time, the Old Dispensary is adorned with ornate carved balconies, stuccowork and stained glass windows. Restored in the early 1990s, the Dispensary housed a small museum which displayed old photographs of Stone Town's waterfront, but the upper floors are now mostly empty. For a stunning view of the harbour, visit the upper veranda, which is open for visitors. There are also some curio shops on the ground floor. The Old Dispensary is a beautiful building and worth passing by and photographing at the very least.